We’ve been in Chiang Mai for a couple of weeks now, and already have a short list of beloved brunch locations. This list is far from complete! We will — of course — continue to be steadfast and continue to do field research. These are not listed in any particular order… therefore you should try them all! 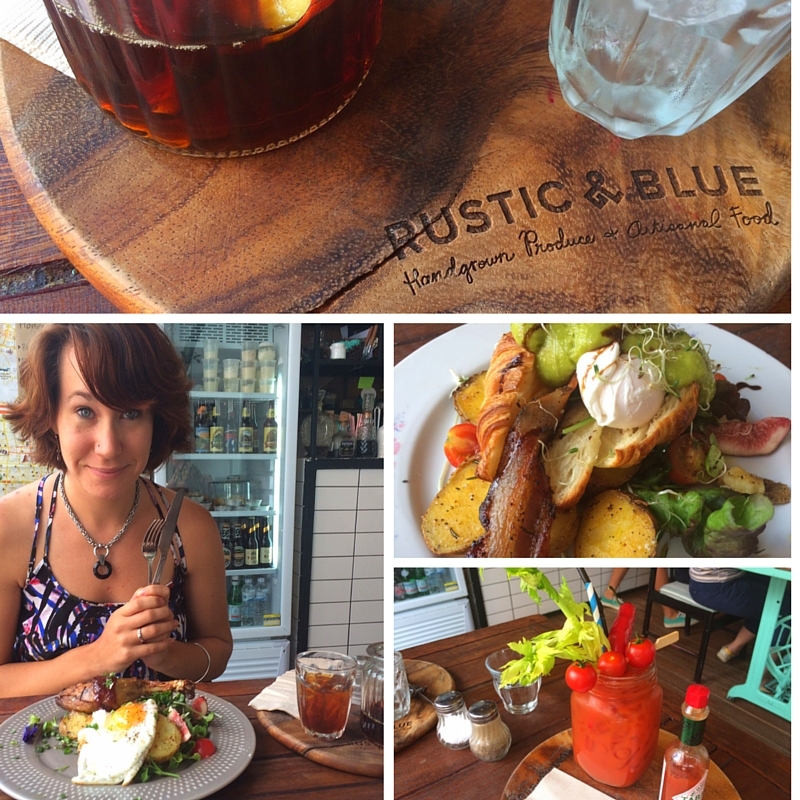 Rustic & Blue transports you to brunch in Brooklyn… although maybe a bit fresher. The prices are not cheap, but the food is pure art! We’ve been there twice in one day, and did not feel a shred of embarrassment. There are unique salad and eggy selections offered throughout the day. Don’t be surprised to find a flower of two on your plate (I’m not really sure if they’re edible), but they are darn pretty. The Americano coffee comes in a large mug and really satisfying heft. The artisan alcoholic or virgin mixed drinks are unlike anything we’ve ever seen, and we’ve tasted some crazy concoctions having both gone to university in the US. ;-) But these are artfully done and not tossed together to get you drunk: we loved the lemongrass mojito and bloody mary. The only thing I can say, is not to go there if you want something put in front of you quickly; beauty takes time — and I think Rustic & Blue excels in this. The Larder Cafe & Bar is a little spot we just found and freakin’ love it — we’ve gone two mornings in a row and you may find us there tomorrow! The restaurant is located down the cutest soi lined with flowering trees, it’s not far from the main road and it feels like a separate world. There’s a great courtyard in front that is the ideal place to enjoy brunch. 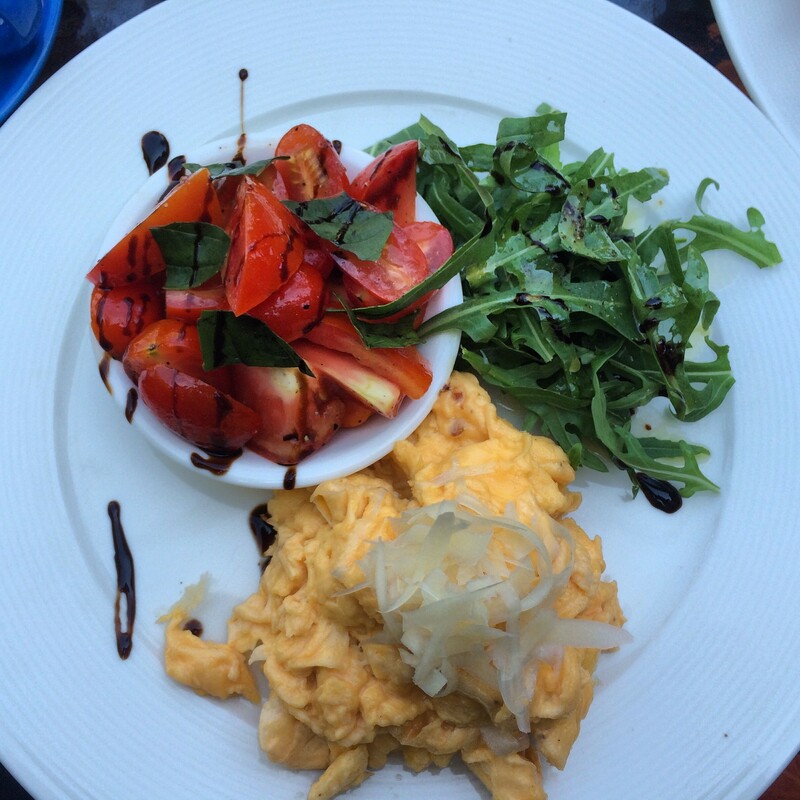 We have fully enjoyed the Parmesan scramble, humus with gooey eggs and spicy chorizo. The Americanos are strong and of average size (you probably should not be drinking too much more anyways). They also have a wide selection of open sandwiches and bagels, that are also awesome and so very tasty. I enjoyed one after drinking — maybe — a little too much at the Rustic & Blue Farm to Table Dinner, and I felt right as rain afafterwardThe service is incredibly nice and food comes quickly. Healthy B Cafe hasn’t received the love it deserves. 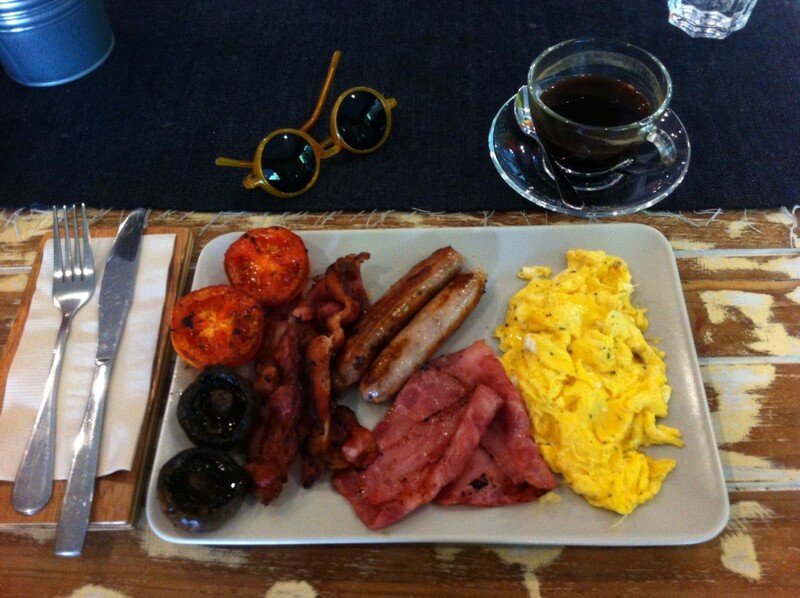 They serve a great selection of brunchy foods and at a great price! We have fully enjoyed the English and Aussie breakfast, that includes hot coffee. Also for the meat lover, the Hearty Breakfast comes with three types of meat and eggs — this dish will not leave you hungry and you may need a nap afterward. They also offer a great selection of healthy smoothies, quesadillas, sandwiches, and pasta. There’s outside seating, but we sat inside because it was bugger hot out that day. The food came quicker than I expected and tasted really well made and fresh. At Healthy B, the dishes feel as good as they taste! 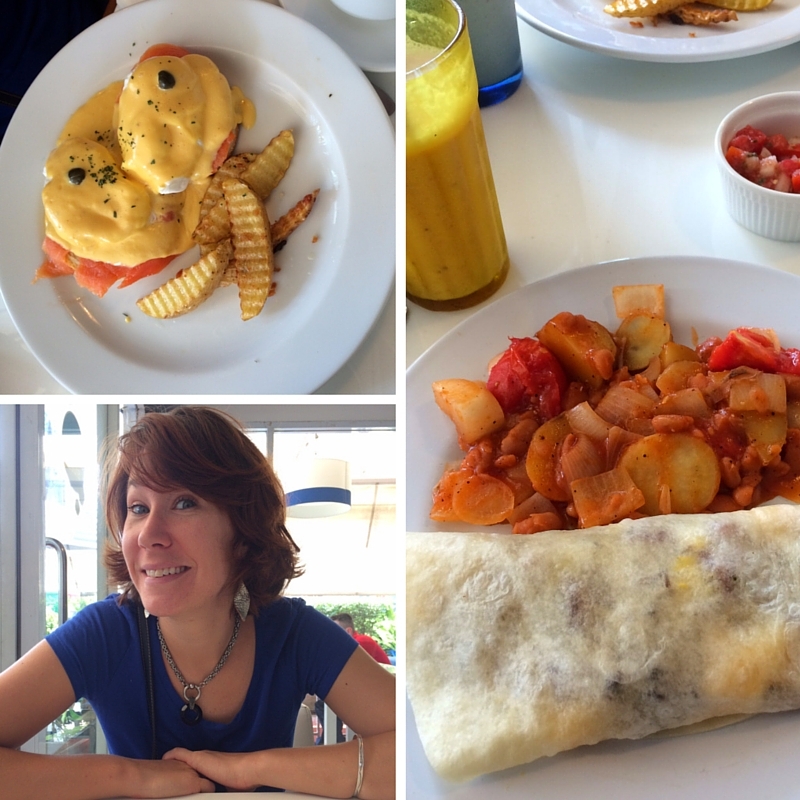 Smoothie Blues was quite busy when we visited and made me think fondly of diner food (at it’s best!) We had a salmon benedict and Mexican burrito with bacon and they were ooey-gooey wonderful. Not that it was “unhealthy” per-se, just that it wasn’t health food; that being said, there are egg white omelets and fresh smoothies to order. But seriously… HOLLANDAISE, you just can’t say “no” to that! The Americanos were a bit weak but good-sized. There is seating outside and inside for sweltering hot days. Alas, there’s no wifi; this is a place to eat, drink and talk, then go elsewhere to hunker down on the laptoppy. If you’re looking for an incredible breakfast spot closer to the Old City, we highly suggest you check out Overstand — it’s another of our favs! 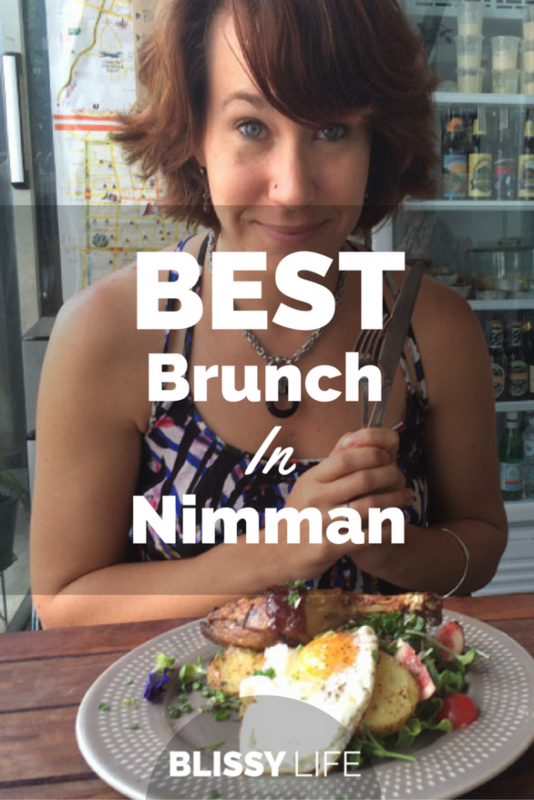 Now that you know where to brunch in Nimman, where will you be napping after your glorious meal?!?! Akyra Manor is one of our favorite hotels in Nimman. Be sure to check out the incredible tub! Check out TripAdvisor for great hotels in Nimman and Chiang Mai! That’s all I’ve got to report so far, but we are always looking for suggestions as we eat breakfast every day — it’s kind of a thing. Great list! I wish I had these last year when I was in Chiang Mai, and I’ll definitely be using this list the next time I’m there. Thanks for the great data. Thanks! Next time you’re in Chiang Mai and going to town finding tasty new spots, do make sure to share them with us!